I live and work in a special place and enjoy being a remote worker. Every March, April, and May , more than 1,000 acres on the Skagit flats burst into color. April brings tulips, and May and into June, the Irises bloom. Two bulb companies grow the majority of the fresh tulips and daffodils sold in the US. They also harvest the tulip, daffodil and Iris bulbs for the fall selling season. 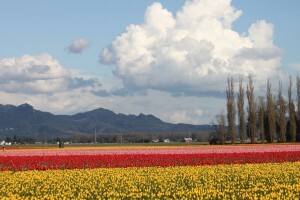 There’s Washington Bulb Co., which grabbed the tulips.com website name, and Skagit Valley Bulb Farm Inc., which you can find at tuliptown.com. 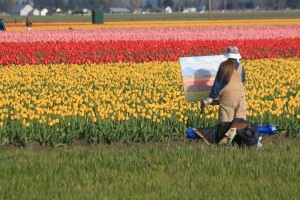 Together, they host 100,000s of visitors for the Skagit Valley Tulip Festival, which runs throughout the month of April. 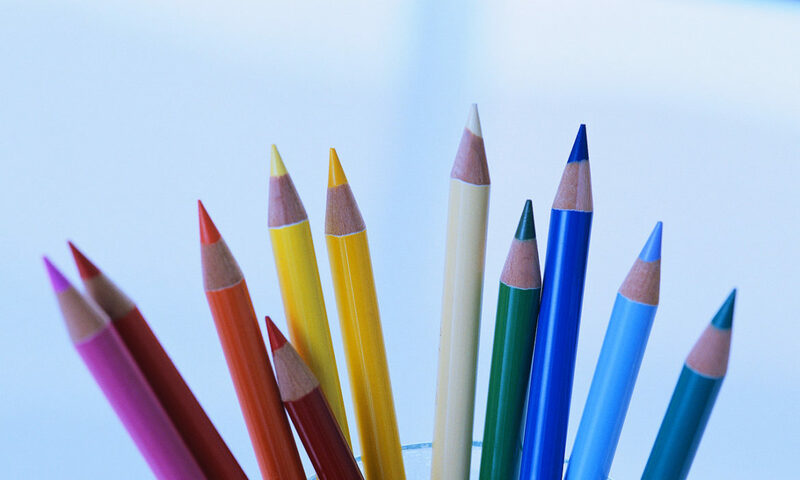 You can see more and learn more about the festival on their website. Last year the bulbs came early. This year the wet weather made the flowers bloom late. We have had more rain than usual, and the sun has only shone for a day or two. When the sun finally came out for more than 10 minutes yesterday, I jumped in my car and went to take photos of the tulip fields. On McLean Road, I saw a beautiful sight: Oksana Zhurakovskaya was painting in the field. At first she said she was from New York, and when I pressed her further, she said she was staying in a small town I wouldn’t know – Jamestown. Oksana’s painting is beautiful and one of my photos of her will grace the front page of the La Conner Weekly News, which comes out tomorrow. If you’d like to see more of her wonderful art, you can find samples of her work at www.zartgallery.org. She has some colorful landscape paintings posted there. I had to pick up one of my daughters from track and my son from baseball practice, so I left the fields and went home. But I was only home for 10 minutes before the parental shuttle swung back into action. Another school activity left me more time to head back to the tulip fields to take more photos. 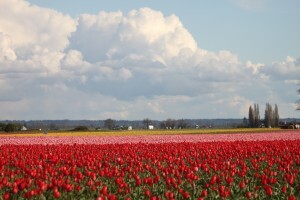 The fields are all grouped on the flats between La Conner and Mount Vernon and because the growers rotate fields each year, you find tulips in various spots throughout a 5 to 8 mile area. I took these two shots on Best Road. If the sun stays out – the weather people aren’t promising any sun this week – I will take and post some more photos. I don’t actually work in these tulip fields, although it is very tempting. I did spend several summers working for a greenhouse growing up and fondly remember watering plants for eight hours at Dickman Farms. I enjoyed helping customers pick out flowers for their gardens and planting massive flower beds for several customers. 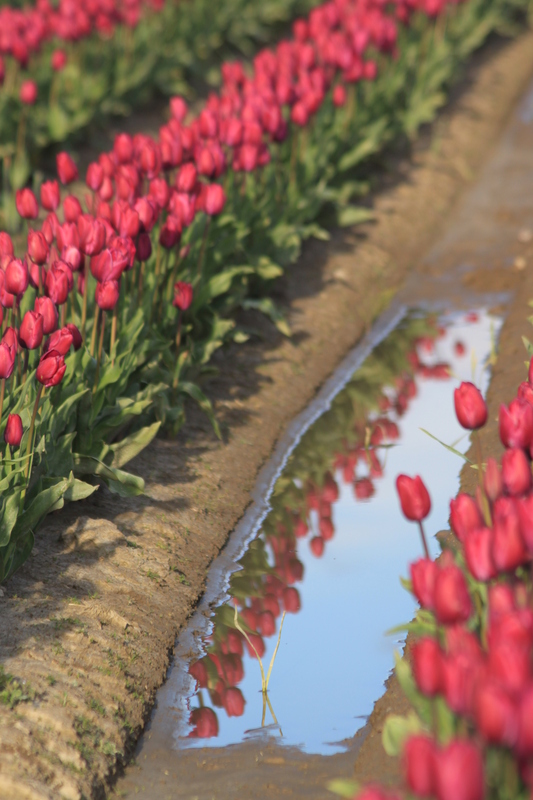 Workers at Washington Bulb and Skagit Valley Bulb are out daily harvesting tulips that aren’t in full bloom to send around the country, and the fields they don’t pick will be left until the flowers die off so the bulbs can be harvested to sell this fall. 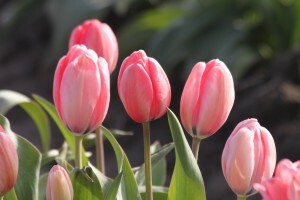 Let me know what you think of the tulip photos and whether you’d like to see some more. I hope my photos have brightened your day. © Photos M. Sharon Baker All Rights Reserved.